Donohew, who has been teaching for 23 years, explains that students are required to log in to Moby Math a minimum of 40 minutes each week. That may not seem like a lot, but it allows students to take full advantage of Moby’s short but specific lessons. Primary teachers (K-1) use Fact Fluency daily. Teachers also use Moby data for weekly PLCs and to drive RTI instruction for Tier II and Tier III students. Teachers promote home use through monthly newsletters, reminder systems, and contests. 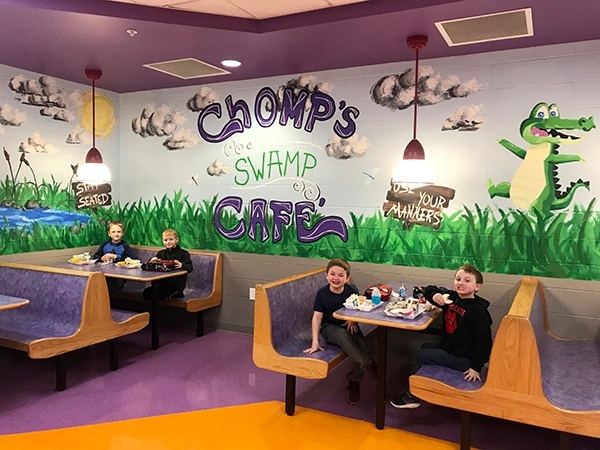 For example, students who sign in at home get a prize from the classroom “treasure box.” Thirty minutes of home use earns a student a special lunch with the teacher, extra recess time, and other rewards. 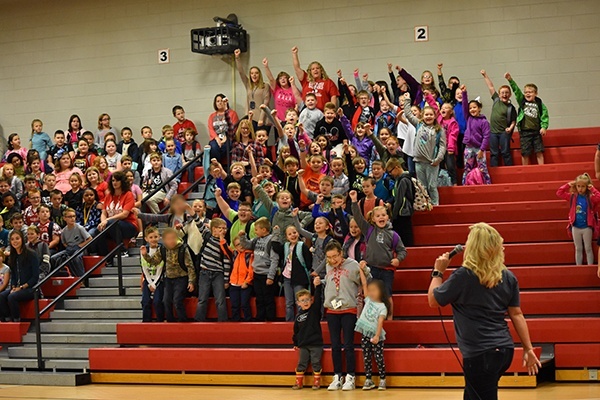 Speaking of rewards, every Friday, teachers recognize students in a special Moby assembly for those who have reached goals for time logged and points earned. Students compete to become a monthly Moby winner, which is the top student in each grade level. Winning this honor earns them and a friend a seat for the week in the Crossroads “Crocodile Café,” a special booth at lunch for honorees. Teachers also hold class contests on a regular basis. “This morning's assembly and Moby Pep Rally were a huge success,” Donohew reported recently. As if the students at Crossroads weren’t motivated enough already, Donohew says the students “absolutely love” Moby’s new Real Rewards program, an approach that motivates students with prizes like sport bags, hats, and parties. Teachers love them, too! “I have some very jealous special education and teacher aides that want a shirt so bad after realizing the classroom teachers are getting one!” notes Donohew. The results speak for themselves. 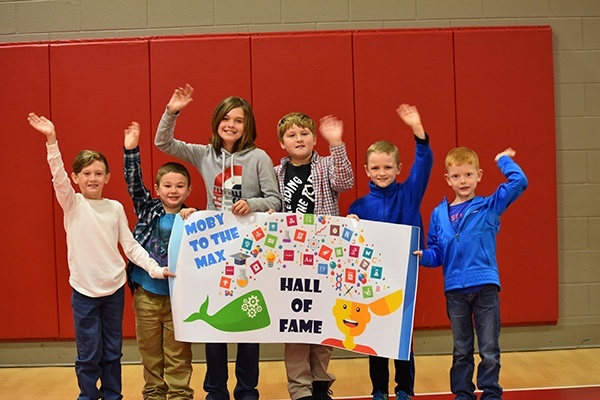 Twenty-six teachers at the school are using MobyMax; of 416 students, 413 are on Moby. Almost 6,000 standards have been completed. “Our students have already shown over a grade level increase in the first two months of school alone!” Donohew reports. “This program brings so much enthusiasm and motivation for math at our school that we can't wait to see the improvement every time we take a new assessment. “The ability to progress monitor specific standards for RTI is wonderful! When a child stops you in the hallway to tell you they worked over an hour at home on MobyMax, then you know it’s fun and that they enjoy it! But that’s not all. 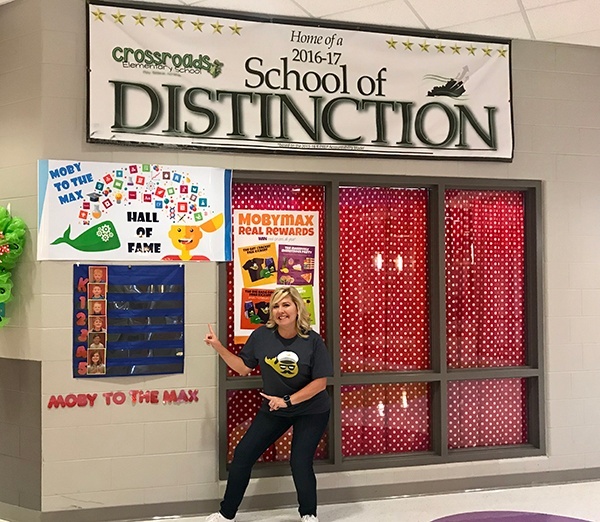 Crossroads Elementary School has been recognized as a school of distinction, which has led other schools to contact them. Their peers have “seen the growth and wish to follow in our Math RTI success!” says Donohew.